Our 5th Annual Men's Basketball Alumni Event will be the weekend of January 18. You're invited back to watch the team practice on Friday (4:30-6:30 pm) and participate in the full slate of activities on Saturday the 19th. 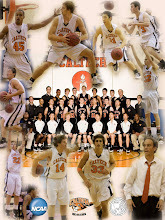 On the 19th, the alumni vs. alumni game will be at 1:30 pm in Braun, followed by a post game meal at a location TBD. 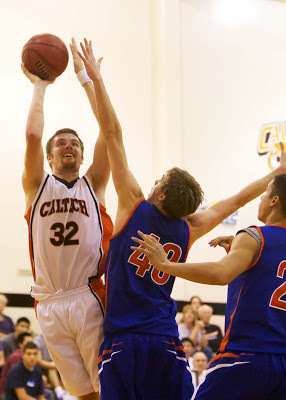 The team takes on Claremont-Mudd-Scripps at 7 pm. Please RSVP to caltechbasketball gmail com with your name and names of guests attending. 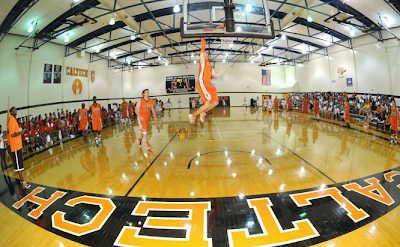 Hundreds of fans filled Braun Gym last Sunday night for Caltech's third annual Midnight Madness. Exciting games and contests for students and supporters took place until 12:00 am when the Beavers basketball teams took the floor for the first time this season. 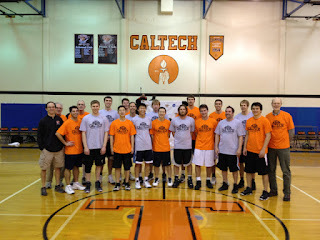 The Caltech pep band played, fans roared, and players unveiled their new looks. 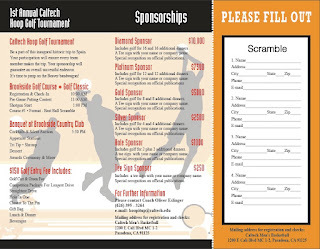 Register now for the Caltech Hoops Golf Tournament! 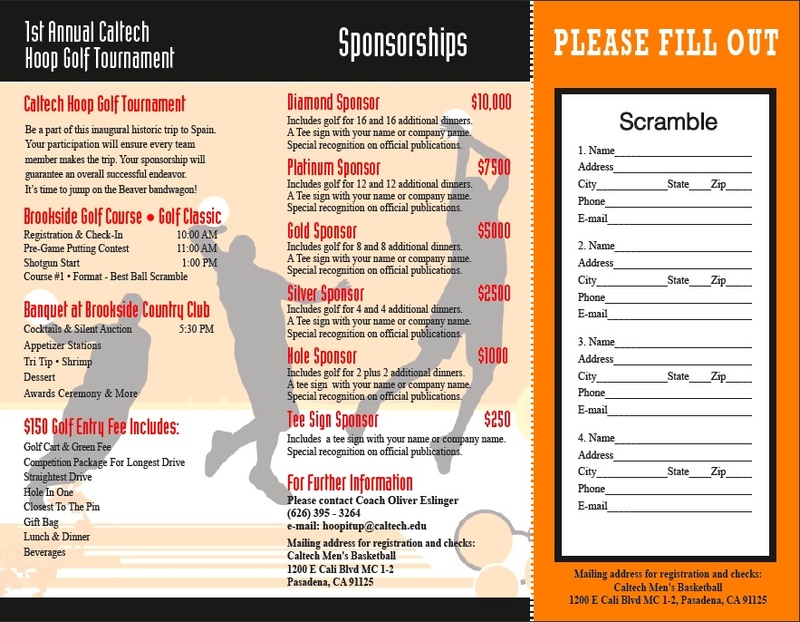 Support the season and the Beavers future international trip with an exciting day of golf and community fun, all at Brookside Golf Club in Pasadena! 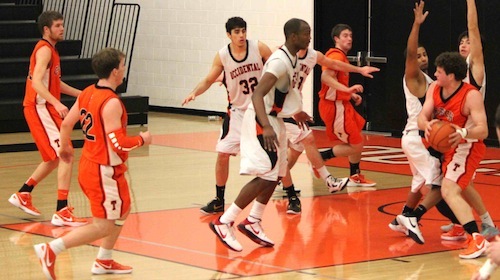 Rising sophomores Bryan Joel and Andrew Hogue had tremendous freshman campaigns. They proved themselves as playmakers and scorers and finished in the program's top 10 in 3-point percentage for a season. And this summer, they are showing their might in the workforce. Joel is interning in Bethesda, Maryland for the Naval Surface Warfare Center Carderock Division. He is working on a couple different projects that will help make certain devices on Navy ships more effective and help sailors safely manage their environment. Hogue is living on campus while he interns at the Jet Propulsion Laboratory in the Protocol Technology Lab working in the field of Deep Space Networking. He is helping optimize combinations of protocol used to send transmissions between spacecraft, satellites, and mission control. 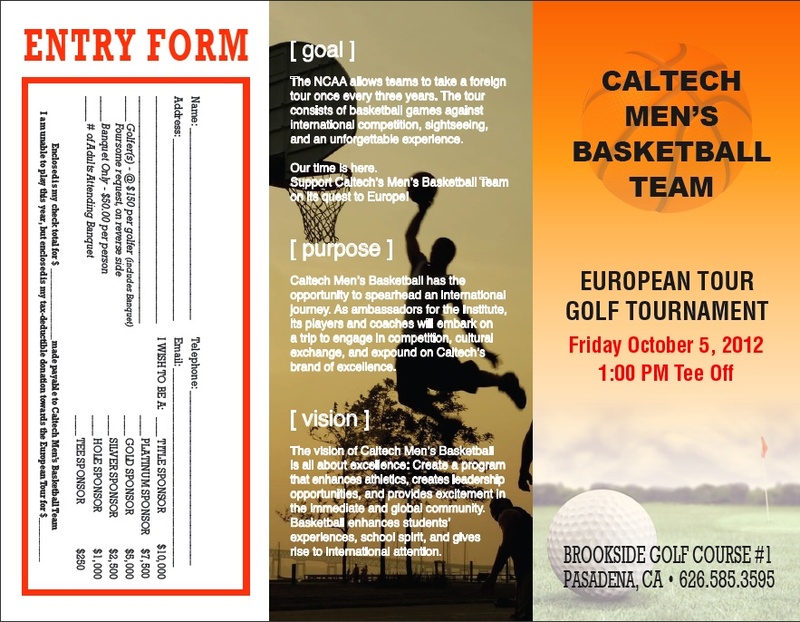 Friday, October 5: Golf Tournament at Brookside Golf Club to support the men's basketball program! 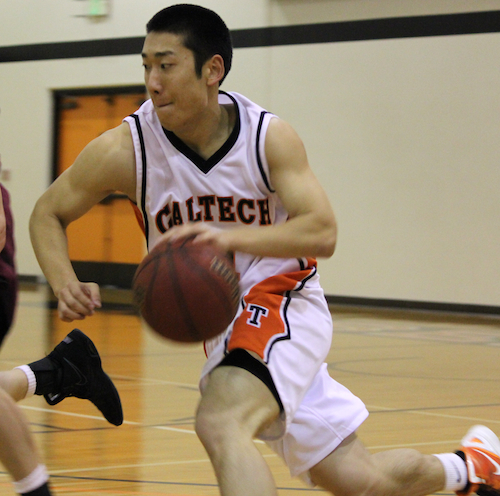 Caltech's captains are rising seniors who have been consistent starters and contributors for three years. 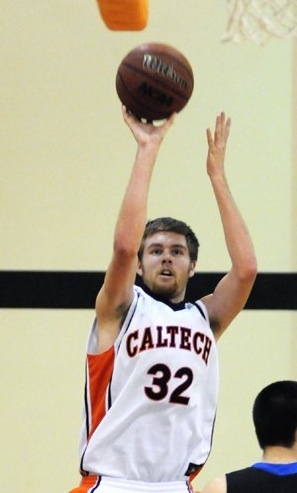 Besides their great work on the court, Collin Murphy, Michael Edwards, and Ethan Boroson are all living on or near campus this summer as they continue to build their resumes. Murphy and Edwards are interning at HoverState 2.0 in Encino. The computer science majors are getting hands-on experience in programming -- everything from developing and coding to design and quality testing. In previous summers, they each have worked at the Jet Propulsion Laboratory. Boroson is involved with a SURF under Guillaume Blanquart. The mechanical engineer major is busy modeling turbulent variable density flows using computer simulations. He interned at GLHN Architects and Engineers (Ariz.) the past two summers. Murphy and Boroson are two of the Beavers top playmakers, often ranking high in the league in assists, steals, and rebounds. Edwards has amassed 1200 points in his career and has finished in the top 10 in SCIAC scoring each of his three seasons. Coach Eslinger addresses the team at the annual banquet. 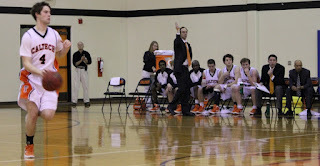 The Beavers wrapped up the 2011-12 season at their annual end-of-year basketball banquet. 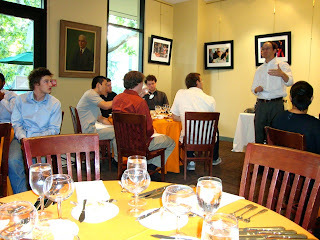 The team enjoyed a delicious steak dinner and all members were honored and presented with various awards. The captains also thanked each coach and granted him a gift. The annual alumni event took place on February 4, and what a day it was. 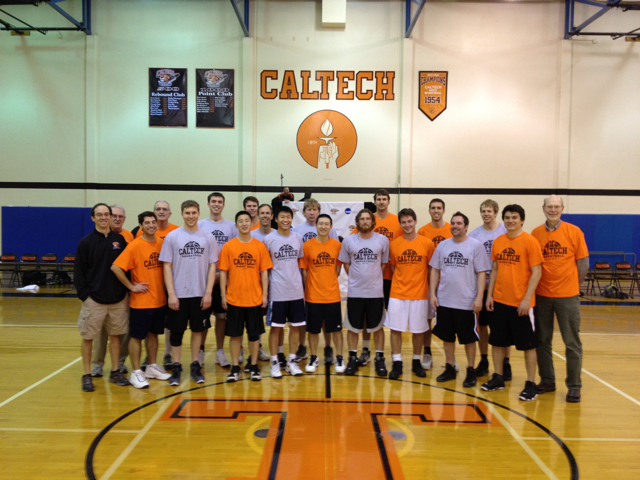 Another great turnout paved the way for a fun-filled alumni game as Team Turk was able to hold onto it's lead in the final seconds over Team Papa. Besides terrific competition, Caltech junior Collin Murphy provided some unforgettable color commentary during the game. (He even aided the officials with timely calls). Team Turk was led by Wei Li with 14 points, 5 rebounds, 3 steals, and 1 blocked shot. 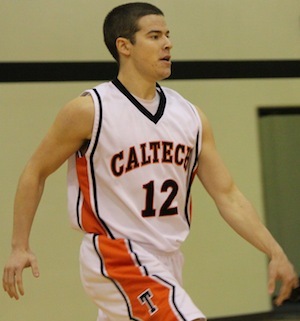 Scott Davies added 12 points while Ziying Wang and Jon Bird scored 9 each. Their opponents made a valiant comeback, paced by an 18-point, 5-rebound effort from Travis Haussler. 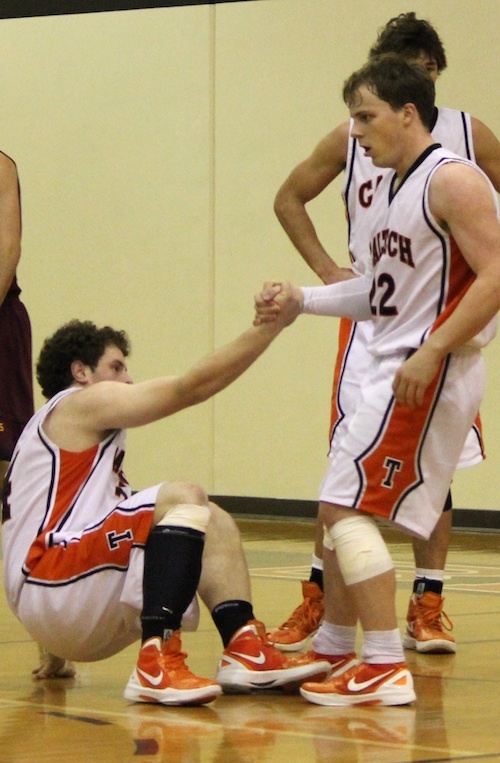 Ryan Elmquist aided Team Papa with 15 points while Papa himself scored 13 points, grabbed 8 rebounds, dished out 5 assists, and recorded 1 steal. 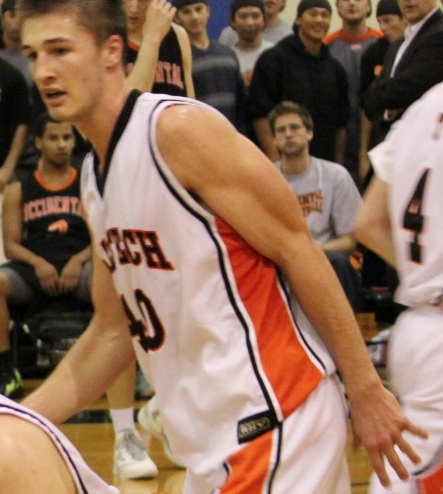 Dave Zito ran the show with several key passes and screens. In the end, Turk, who had 7 points and 6 boards, steadied his team and managed to endure the offensive onslaught by Papa's peeps. Prior to the varsity game that night, the top rebounders in Caltech history were honored for accumulating 500+ boards during their careers. Just because the season ended early this week doesn't mean there isn't worthy news. The season review, including records broken, are forthcoming. Several team milestones were achieved as well as plenty of individual highlights. A summary of another successful alumni event is also on its way. Until then, read up on Collin Murphy's last post on HoopSpeakU, Coach Eslinger's contribution to ESPN's TrueHoop, and check out images from the 2012 season.